They are great for strength training and any fitness activity requiring advanced grip and endurance. They are also widely used and recommended by atheletes in aerial dance, lifting, cross-fit, ring, bars, poledance, trapeze, handbalancing, and gymnastics. The Mighty Grip Pro Tack Gloves are sewn with heavy duty nylon thread with a tight double stitch. 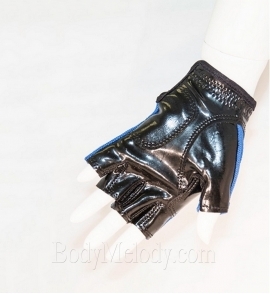 The gloves are flexible and mold to the palm of your hand for a snug fit. Tips: Take them off and on like socks (inside-out). To prevent the gloves from slipping against your skin, make sure it fits on tight and apply a small amount of Mighty Grip Powder to the palms of your hand before putting the gloves on.